I don't usually read horror, because I'm a scaredy-cat, but Andrew Michael Hurley's The Loney is more than just a horror novel. When the remains of a young child are found on a section of bleak Lancashire coastline, Smith is forced to think back to a pilgrimage he took with his parents, disabled brother Hanny, and figures from their church to The Loney in 1976. The Loney starts very briefly in the present, as Smith makes an introduction to the reader that makes it clear something is not quite right. And then we're hurtled back in time to the 1970s, where we meet a younger Smith, his brother Hanny and their extremely religious mother. It is Mummer, as Smith calls her, who seems to instigate the events of the novel, by organising a pilgrimage to The Loney, accompanied by Father Bernard, the new priest at the local church. Also accompanying them are a couple who were related to the previous priest, who died in mysterious circumstances after something happened on a previous pilgrimage to The Loney, and the church's young assistant and her boyfriend. It would be easy to say that The Loney is about religion, but it's really more about faith and ritual, and the comfort they bring, in particular to Smith and Hanny's mum. She is fierce in her need for certain routines and rituals to be carried out when the group are at The Loney, even though in previous years they haven't succeeded in curing Hanny's muteness. Mrs Smith is deeply Catholic, but she also seems to subscribe to much older, almost pagan rituals - anything she can call vaguely religious and that might help Hanny is good for her. But Mrs Smith's need to help Hanny is more a need to help herself, because if Hanny gets better it's proof that Mrs Smith's devotion has paid off, and that she is more devout than anyone else. It's frightening, and an unexpected element of horror in the novel. The other scary elements come from some of the people that Hanny and Smith meet while at The Loney - the mysterious pregnant girl and her odd, glamorous parents, the group of farmers who are really threatening. The novel weaves these characters, who all gave me the shivers from the beginning, together to a climax that is terrifying, and largely unexplainable. Putting aside the horror for a few moments, the other thing central to the novel is the relationship between Smith and Hanny. Theirs is a relationship built not just on blood, but also on the shared need to survive their mother, and on the fact that they can understand each other without the need for words, something Mrs Smith cannot comprehend. What happens to them at The Loney not only strengthens their bond, it also completely changes the dynamics of their relationships. 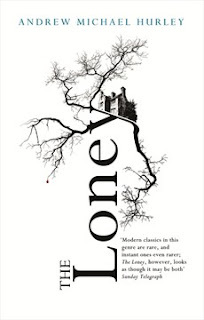 The Loney reminded me more of The Turn of the Screw or something by Edgar Allen Poe than it did a modern horror story, and that's the element that made it such compelling reading. It's spooky but it's clever with its frights, and about so much more than just being scary. It's an examination of faith, love, loyalty, and brotherhood, and while it will leave you feeling uneasy, it'll also leaving you feeling you've glad you've read something both so classic and so modern. •The Loney is released by John Murray in the UK on August 27, 2015. How I got this book: From the publisher, John Murray. This did not affect my review.